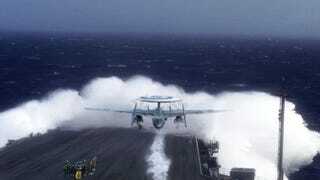 If you thought that only landings were hard on aircraft carriers, David Cenciotti at the Avioationist found this photo an E-2 Hawkeye launching through a wave, just as "the ship's bow lowered." I'd imagine that they time the launch so the bow goes back up at the precise moment when the plane leaves the carrier, but perhaps some sailors in the audience can explain it better. The Northrop Grumman E-2 Hawkeye is an all-weather twin-turboprop used by the US Navy for long-range detection of aircraft and ships, and to provide "control and command of the battle space in an air engagement by directing fighter and attack aircraft strikes."